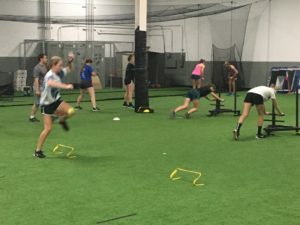 18U speed and agility class is the next step for any athlete to take if they just want to make the team, get a tune up to play their favorite sport, or prepare for the college setting. We work on the skills necessary to improve running technique and form in the warm up and progress it to more complicated and complex speed drills through the session. Each athlete has a hand written strength-training card based on their ability level and age. High school age athletes will be doing more complex exercises and the middle school athletes have to work their way up using a progression mastery system before they can move on to more complicated exercises.